5-room house, detached, for 8 people, 150 m2 on 3 levels.Living room with satellite TV, DVD, video, radio, hi-fi system, CD player, open fireplace and dining-table. Smoking not allowed. Internet (Wireless LAN [WLAN]).Sleeping room with 2 single beds. Sleeping room with 2 single beds. Sleeping room with 2 single beds. Sleeping room with 2 single beds.Open kitchen with 4 hot plates, micro wave, oven, grill, dining table, dishwasher, fridge and deep freezer. Food service: breakfast (extra), full board (extra), half-board (extra).Bath/WC, shower/WC, bath/shower/WC and separate WC.Balcony 4 m2, terrace 8 m2, terrace furniture, box-room, 4 deck chairs.Other equipment: children's high chair, hair dryer, iron, whirlpool. 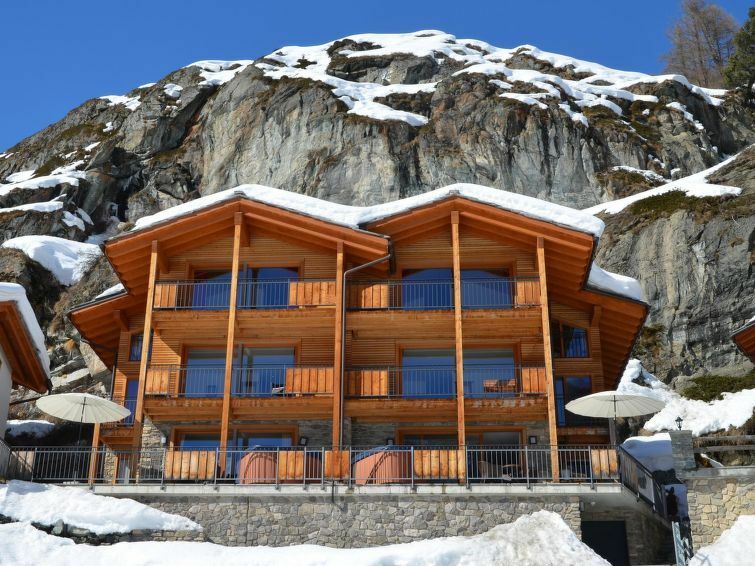 New, large, luxurious chalet Chalet Pollux, built in 2008, surrounded by meadows.House Equipment: whirlpool, washing machine (shared use), tumble dryer (shared use).Access & Parking: no parking possible. Footpath, stepped path with 35 steps. Situation: on the outskirts, quiet, elevated, sunny position in the countryside, on a slope. View from the apartment of the mountains, the resort and the countryside.Surroundings of the house: grounds (shared use).Facilities and distances: shop 300 m, grocers 300 m, supermarket 350 m, restaurant 200 m, tennis 350 m, tennis club 350 m, ski lift 200 m, ski school 350 m, ice rink 350 m, mountain lift 200 m.